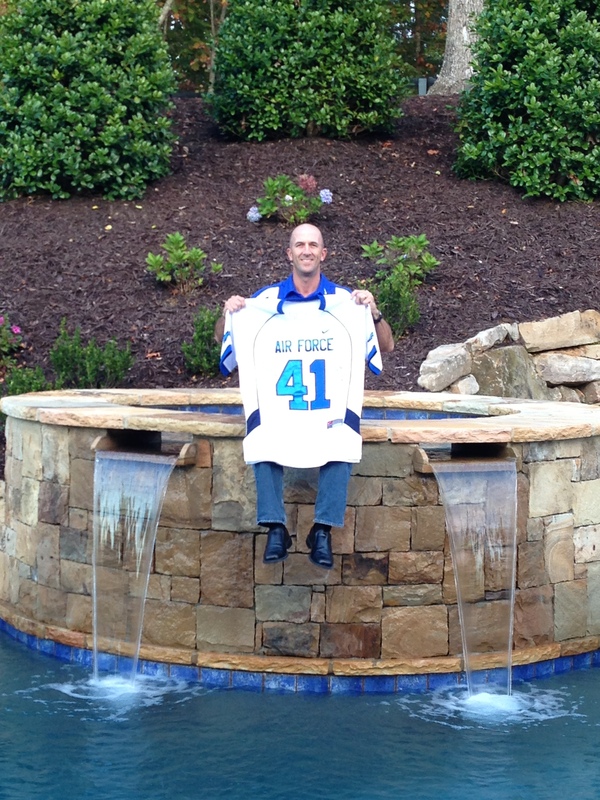 Well, after making its way across several states and countries, the #41 jersey finally made its way to me. Bobby Lietzke presented it to me in front of the team on Michigan State weekend. Needless to say, it was hard to maintain my composure when Bobby draped the jersey across my now frail chest. The jersey ended up with 103 signatures, including 3 members of the College Football Hall of Fame and a Heisman Trophy finalist. Many of the signatures are from Generals and war heroes. I know every one of them and every single one of them would do anything they could to help me. Many already have done so much. Humbling. Don’t ever doubt the Bolt Brotherhood, it exists in a very meaningful way. Thank you Bobby and everyone who signed it. Kreg, I feel as if my family has lived much of my football career through my stories. I shared several on my own, the rest are a result from the many questions they have about the game and “life” in the Big House. Please note; you are part of their common understanding of what it means to be part of the “Bolt Brotherhood”. I shared some stories about a few of the games, practices, and workouts we had during those years. Each time I tell them, it brings a smile to my face. Coach DeBerry, Coach Johnson, playing FB in Mexico, the Freedom Bowl, the Slugs, are you kidding me? We had some wonderful memories and I feel blessed to be a part of it. In the end, all I wanted to do was play D-I ball as a kid. Seems fairly crazy and fairly unrealistic now. Honestly, I don’t know how anyone makes it. The odds are so unlikely. I want you to know our thoughts and prayers are with you. You are an integral part of our collective DNA now and through the rest of our lives. Stay strong my brother and always feel free to reach out to any of us for any reason. I’m another Falcon – a year ahead of your father. Since I was an offensive lineman, your dad & I ‘crossed paths’ on occasion at practice. Off the field, Kreg hung out with the DBs, who thought they were special because they had a little athletic ability, while I was with the linemen. We were special because we were better looking and ate more. Almost 30 years later, I am still hanging out with the offensive linemen since I coach them at Warner Robins High School in Georgia. Since learning of Kreg’s battle with ALS and your blog, I use his story as an example of true character, strength and courage. Some of my players think they are ‘up against it’ from time to time and they do face some tough issues, but few of us have faced a situation or opponent like Kreg has. He is a model of how to battle real adversity in a way that inspires others. The Warner Robins Demons are pulling for Kreg through this. We wish your beautiful family all the best and will continue to follow Kreg’s progress. You are all in our prayers constantly. Go Birds – Go Demons! Kreg, wish we all had the courage and strength that you have! It is an honor to sign your jersey and send along to other “family” members to sign. Stay strong and know that thoughts and prayers are with you every day. Tom Kafka (Class of 1990) here in Panama City, Fl. ALS has touched me personally also. My Dad had it. My Dad, Like Your Dad is Loved by just about everyone who knows them. Like my Dad, Yours always has a smile on his Face. Like your Dad, they never give up and care more bout others than themselves. Michael J. and I were sophomores at the Academy when your Dad was a senior. I actually remember in my freshman year and the first time I realized that Kreg was one the fastest white guys i had seen on a football field. It was when he was lining up to catch punts and I wondered why we had a white guy catching punts. Then he caught the punt and started running. Anyway, a couple of weeks ago Michael J. flew in on a Tuesday night and on Wednesday we visited a few different locations. The first was in Fort Collins, Colorado (where I live), and it was Hughes Stadium, the home of the CSU Rams where your Dad played his Senior year. Being as they are a big rival, we thought it was a good spot to take a picture with the jersey. Unfortunately, there was not any facilities staff on site so we could not go onto the field. And we did not think that jumping the fence would be a good idea at our age. The second stop was Mile High Stadium, home of the Denver Broncos. We really wanted to get an “on the field” photo so we walked around the stadium and met some really nice people who made some calls to the stadium maintenance staff and next thing you know we were on the field. Not only did we get a photo on the field, but also in the Bronco’s locker room, and in the Post Game Press Conference Room. Of course we had to take some cornet photos in the Press Room. Then, on the way to the airport to drop Michael J. off for his return flight that afternoon, we also stopped by Coors Field, the home of the Colorado Rockies. We couldn’t park very close to the stadiums we just pulled over in a red zone and did a “Chinese fire drill” with the camera and tri pod and got our last shot of the day. Be assured that all of your Dad’s Falcon Brothers are keeping you and your family in our prayers. Class of ‘89 representing! Anthony “Roby” Roberson, Tim “Brownie” Brown, Rob Krause, and Andy Smith at the Kevin Shea memorial statue observing Memorial Day and sending our thoughts and prayers to Kreg and family! Stay strong! The Falcon Brotherhood is always at the ready to support! All the best to you and your beautiful family. There are questions each of us have that won’t be answered until the hereafter. We will continue to pray for you and your family. We had some great days as Falcons, thank goodness for those days. See the attached picture of your jersey in front of my “I love me wall”. Kreg, know that you and your family are lifted up in prayer each and every day.As Coach Mac would say, “Geez-oh-Mōzee boys we can beat these guys”. You can beat it! I join the chorus of Falcon Brothers who love and respect your father dearly. My name is Dave Hlatky, and I was a year younger than your dad. I was an offensive lineman, so your dad and I made “contact” a time or two. I am on the right in the photo wearing glasses. The other guy in the photo is my genetic brother, Greg. I asked him to share in the photo for two reasons. First, because he played for Navy during your dad’s senior year, and I think they actually played against each other. Second, because only a “brother” would generate such an outpouring of respect and hope.I’m sure you’ve heard some great stories about the elegance and class your dad displayed back at the academy. You’ve probably also heard a lot about his toughness and tenacity. Your dad is one of those guys who always kept working and never had much negative to say. I can’t imagine how difficult things are, but I’m certain I know exactly how your dad is facing them.It pains us all to know that you all are challenged by this. We keep your family in our thoughts and prayers. It’s wonderful to see what you have done to keep your dad’s spirits up and I am very happy to hear the positive results from the stem cells. It is a sincere privilege to have been your dad’s teammate and I am thankful for the chance to let you know how much the brotherhood cares about your dad and your family. 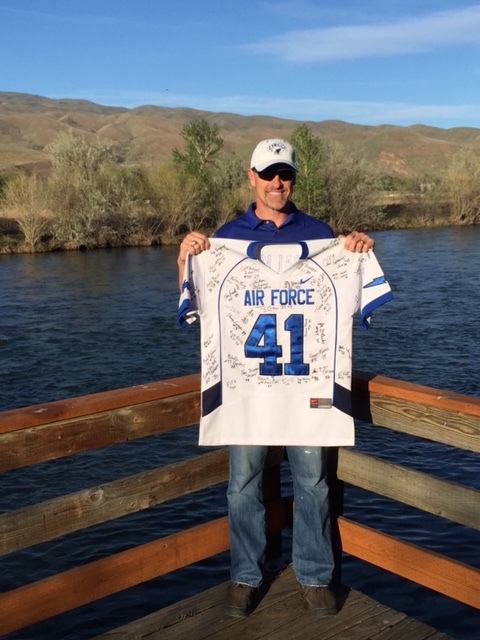 Hello, my name is Eric Faison (class of ’90) and I had the honor and privilege of being your father’s team mate during the 1986 and 1987 seasons at the Air Force Academy. Earl Scott (class of ’91) was also a defensive back. We continue to keep Kreg and your family in our prayers and acknowledge his brave fight to overcome his illness. The attached pictures are at RAF Mildenhall, United Kingdom and the aircraft is a CV-22 Ospreys. I’m sure your father passed through this base a few times while flying with the Air Force. The poem below was introduced to me a few years ago and reminds me how Kreg has always tackled life’s challenges. Give Kreg and your family our best! Eric said it perfectly…my only addition is that your entire family is in our thoughts and prayers as you ALL fight this battle together! God bless and God speed. I think of you often. My memories are usually of us skiing moguls on a day we should have been splicing film and then standing in front of Maj. Mitchell answering some awkward questions, playing basketball during our coach’s lunch break or hanging out at some bar in Tempe trying to relieve the stress of pilot training. You are definitely in some of my fondest memories as I am sure you are part of many other’s as well. Strength is something you’ve always had in spades and I know it is serving you well now. Your friend and brother. Kreg, I gave your jersey a little San Diego sunshine! Remember DB’s have to have short memories after a bad play because the next play is Ours! Keep the Faith! Here’s to You my Brother! Mike Toliver #43 class of 87. We wanted to honor Kreg and his service to our great country with this logo. “Don’t you ever, ever, ever, ever give in or give up and we will win !!!! We missed the first pass through San Antonio, but the timing was perfect as I was able to catch Jimmie returning home from the middle east just as the jersey arrived. Keep smooth, Kreg, and stomp this thing in the dirt. Our thoughts, prayers, and Falcon strength coming your way. 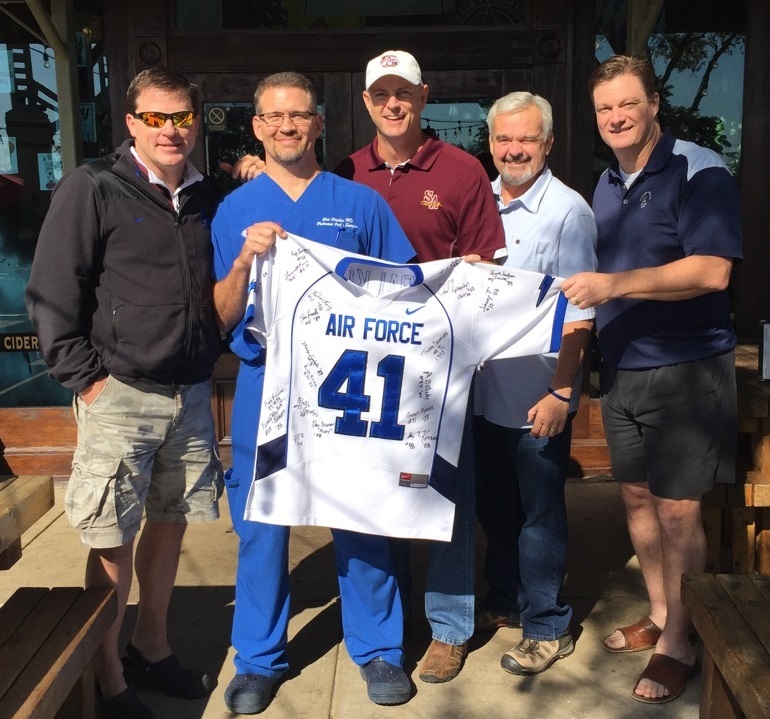 The jersey spent some time in San Antonio, where 9 football friends and a Pilot training friend gathered to sign it. Thank you Forrest for hosting, and thank you guys for the photos! I am inspired by the attitude, the courage, and the endurance that your dad is showing all of us. As an old saying goes, “Heroism is endurance for one moment more.” Your dad is a hero to many. Please let him know that Tammy and I are praying for him. Greetings from Atlanta watching the Falcons take back our trophy. You are in our thoughts and prayers. Stay strong my brother. Hey Wig! I’m praying for you and your family my brother. We are all pulling for you. Keep up the good fight. Prayers your way from Okinawa. Kreg . . . You are in our prayers every night. We KNOW you are going to beat this. Looking forward to seeing #41 Friday and Saturday. Go Falcons!!! With great pride in you, we’ll be 41’s also! !